Here are parts 1, 2, 3, and 4. For BH nerds, this is probably the most interesting chapter in Tomlin and Whitehead’s Holy Roar. That’s not to say it’s a good chapter. But, if you chase down all the BH claims made and read more in the grammatical and lexicographic literature on /barak/ in BH, then you’ll find there’s whole lot here that most folks don’t talk about much in church. What does it mean to bless the Lord? Christian music moment: I grew up in the Houston area and was introduced to Robbie Seay’s music as a child. I’ve seen him live many times and I even enjoy his worship music even though I don’t like the fact that worship music is a genre separated by lyrics and that when we praise the Lord and bless his name somebody who is not the Lord gets the physical blessing of a royalty or portion of a licensing fee. Anyway, Robbie Seay has a translation of Psalm 134 that is probably my favorite modern version. Every time I think about the phrase “bless the Lord” this song gets into my head and its exciting because Robbie is a great artist. So, when Robbie tells me to bless the Lord and that piano is pounding and it makes me want to move, what is he telling me to do? 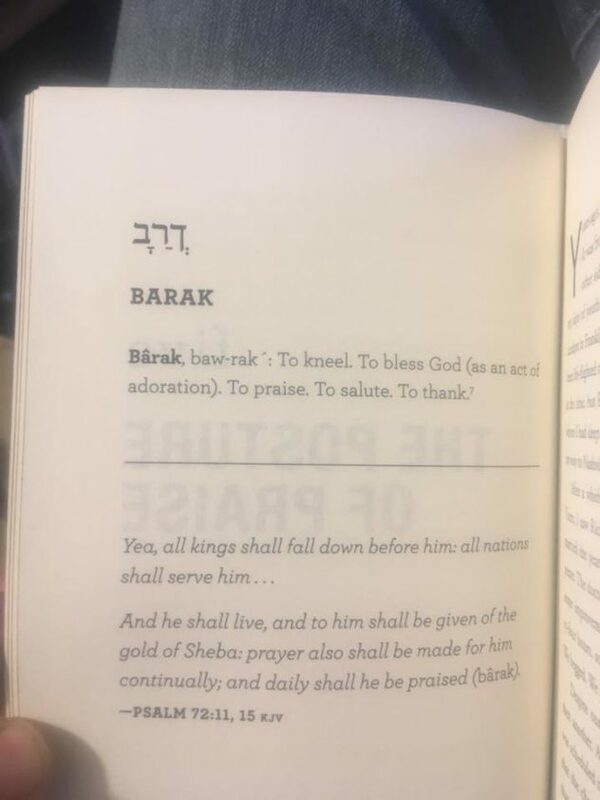 As with all the other BH words in Holy Roar, the authors have also misprinted ברך /barak/ and have instead printed something that isn’t able to be properly transcribed because the mistake is so egregious and nonsensical in BH. It is clear through the mistake that what is terribly printed might, if you’re drunk, be pronounced /karab/ because, like the others, it’s printed backwards. However, unlike the others, the authors have now started a BH word with a final form, the final /kaf/ ך. Some BH consonants are written differently if they occur at the end of a word rather than at anywhere else. The כ /kaf/ is one of these. Instead of being curved on the right side, the final /kaf/ ך is a vertical straight line down on the right side. BH students learn the difference between regular consonants and their final forms in the first lesson on the BH alphabet. This kind of mistake shows that the authors not only are not competent in BH, but they have likely never taken a single BH class. It is disturbing then for Whitehead to claim (p34) that he “read” anything in the “Hebrew of the Old Testament”. It literally only takes one class to not make this mistake that is made with the printing of ברך. As is generally Whitehead’s method of study, he collapses all the usages of the root /barak/ on top of each other as if they are all equally used in the way they are distributed. Untrue. Actually, as with many other cases that we have seen, the different semantic usages of the root are exclusive to certain verb stems. Or more simply, he again wants to force meanings from one stem on to another. Whitehead copies-and-pastes Strong’s Concordance and claims that /barak/ means “To kneel. To bless God (as an act of adoration). To praise. To salute. To thank.” He then uses this information to claim that /barak/ means to kneel before God and so that should also be our posture in worship. This claim assumes that the root word /brk/ was first used as a verb for “kneel” and then over time, because of the association with kneeling and devotion, came to also be used to mean “worship/praise/bless”. However, recent scholars disagree. More recent lexica with better methods have separated these different usages of /barak/ into two different words in their lexica: /barak/ 1 and /barak/ 2. /Barak/ 1 only occurs in the Qal and Hifil stems as an active verb and means “to kneel” (in the Qal stem) or “to cause something else (a camel) to kneel” (in the Hifil stem). So, the more thorough lexicographers do not accept the etymology that the authors use to make their claims about how we should posture ourselves before God. However, the authors of Holy Roar are not the first to make this claim about /barak/. Others have also speculated that /barak/ was first used as a verb for “kneel” and then later came to be used as a verb for “worship/praise/bless”. It has long been a folk etymology passed around that has not stood up to the scrutiny of modern scholars. Nevertheless, it’s worth a look into. The NIDOTTE theological lexicon of BH states that the “traditional association of ‘kneel’ and ‘bless’ derives from the assumption that the person who was to be blessed knelt to receive the benediction” (Vol. 1, p740). In the ancient near east (=ANE), a social higher could bless a social lower, but the idea of someone lower on the social scale blessing someone above their class did not happen. All blessing language from religions surrounding ancient Israel have gods blessing humans and humans blessing each other, but certainly not a human blessing a god. That literally never happens in the ANE except in the Hebrew Bible. This means that if /barak/ 1 and /barak/ 2 are indeed the same word (meaning, if “kneel” and “bless” are indeed the same word), then the correct posture of kneeling is for the one who is getting blessed, not the one doing the blessing. This means that not only do we bless the Lord, and it is a foreign and strange idea for a human to bless a god, but we also would be saying that the position of kneeling is for the Lord to take so we can bless him. After all, if the one being blessed takes a knee to receive the blessing, then it would be God who kneels when we bless him. This is another reason lexicographers reject the idea that “kneel” and “bless” are in fact the same word because we kneel before God, he does not kneel before us, they argue. The authors use a few references from Psalms to support their claims. This instance is a Piel imperative of /barak/. It is a command to bless the name of God, Yahweh. The authors suggest that as this means the command to bless God it simultaneously is also a command to kneel before him. One wonders how this might actually be done in the context of Psalm 100. How can a worshipper kneel while also entering his gates and courts? Did ancient Hebrew people really understand this use of “bless” as “kneel” when moving from one place to another? 15 May he live! May they offer him gold from Sheba! May they continually pray for him! The authors use Psa 72:11 and 15 as another support for /barak/ as both “bless” and “kneel”. However, the verb /barak/ only occurs at the end of v15. The verb translated as “bow down” in v11 is a completely different verb (that is worth discussion in its own right, cause its weird, but suffice to say that it is not /barak/) and so some might mistake that translation “bow down” as a reason to understand /barak/ as both “bless” and “kneel”. As NIDOTTE says, the one who kneels is receiving the blessing. This is why the kings of the earth bow before the Davidic King in Psalm 72. They bow in a position to receive a blessing from the King in Judah (in v11 with a “bow/worship” verb that is not /barak/ (the verb is a form of /hishtachavah/ if you must know)) because he does so many great things, as vss 12-14 describe. In v15, the King’s subjects will now bring him tribute and pray for him and bless him. This is a human-to-human blessing and there is nothing in v15 that specifies posture. This is also evidence in fact that /barak/ in v15 does not mean “kneel” since the Davidic King is the one receiving the blessing. If his subjects bless him and to be blessed means to be kneeling because kneeling is the position of receiving blessing, then that would mean that the Davidic King is the one on his knees receiving the blessing. This would be contrary to what is stated in v11. It is not the Davidic King who bows, but the other kings who are his subjects. They bow /hishtachavah/ and then they bless (/barak/) the king. This suggests, as more recent scholars have concluded that /barak/ should rightly be considered two words (/barak/ 1 and /barak/ 2) and the etymology of “kneel” related to “blessing” should be rejected for BH. That etymology might have been the case in other languages, but it is not the case in the Hebrew Bible. The authors state (p74), “Scholars of the ancient Hebrew provide additional insights into the word /barak/. They believe that in the original context, the term did not simply mean bowing down. Instead, it carried the connotation of bending low while keeping one’s eyes fixed on the king.” They do not state which scholars say this. There is no other reference for this chapter except for Strong’s, and this statement does not come from Strong’s. So, how can Whitehead credibly claim that scholars state this? Actually, as shown above, scholars do not agree that /barak/ means both “bless” and “kneel”. It is good that Whitehead is not falsely attributing this to someone who has not said it (as he did in the previous chapter). However, this claim is simply not true. Scholars do not that this is what /barak/ means. It is more likely that Whitehead created this himself and wants there to be scholarly support of this statement, but there is not. Whitehead then moves to use his new definition of /barak/ as “be transfixed” as the proper way to read /barak/ in Psa 103:1-2, 20-22. These are indeed commands to “bless” or “praise” God, but there is nothing explicit about posture, despite what Whitehead claims based on dubious etymology. Actually, in many places, /barak/ explicitly does not mean “kneel”. In fact, in many occasions, standing is the correct position to take when one blesses (/barak/s) the Lord. In Psa 134:1 (the Robbie Seay psalm), it says “Bless the Lord all you servants of the Lord”. A parallel word for “servants” is “the standers” (substantive participle of /’amad/) or “the ones who stand”. In this context of Psa 134, “the standers” are the ones who minister in the Temple through the night. They are to bless the Lord while they are doing their ministering work which is called “standing”. This is not so much a posture as it is an office. The “standers” had various tasks within the Temple to perform. The idea that they would be on their knees while blessing the Lord as they do their tasks is incorrect and silly. Also, in Neh 9:5, Levite priests commanded an assembly of Israelites to “stand” and “bless the Lord”. The correct posture in this context was not kneeling, but on one’s feet. The use of “bless” /barak/ here cannot mean also to kneel. This example shows that the idea of “kneeling” is not connected to the verb /barak/ when it is used in the Piel stem as a verb of blessing. The etymology espoused in Holy Roar simply does not stand up to the biblical evidence of how /barak/ is used. Like others, this chapter is based on bad etymology that not only is no longer accepted by scholars, but the etymology used was not even applied to theology in the right way. I’m having fun doing the Hebrew in this series of reviews. But I’m very ready to be done with this book. BTW, if you, or Chris Tomlin or Darren Whitehead, want to learn biblical Hebrew, it can be easy and relatively cheap. There’s lots of help available to us today and the only problem we run into is our own prioritizations. I do not think that all Christians must learn to read BH, just those who want to write books about it or have their exegesis taken seriously. Previous Does The UMC Follow It’s Own Rules?